ORDERED, That the Report touching the Nomination of Sheriffs be made on Saturday Morning next. Ordered, That on Saturday Morning next, the Parliament do take into Consideration the appointing Judges for the Lent-Circuit. Ordered, That Mr. Speaker be, and is hereby, impowered to give unto James Pearse, Surgeon; John Southerne, Quarter-master and Marshal, in Colonel Eyre's Regiment, their Commissions, after the House is up. Ordered, That Colonel Eyre be, and is hereby, impowered to give unto Captain Fryer, and Lieutenant Camfeild, their Commissions formerly signed by Mr. Speaker, but not delivered to them, by reason of their being absent, upon Duty. Ordered, That Mr. Speaker be, and is hereby, impowered to give unto Ensign Godson his Commission to be Ensign in Colonel Streater's Regiment, after the House riseth. Ordered, That, on Friday next, the Bill touching Recusants be brought in and read. A Bill for the Approving and Justifying the late Actings of General George Monck, was this Day read the Second time; and, upon the Question, committed . . Sir Arthur Hesilrig, Colonel Morley, Colonel Martin, Colonel Sir Anth. Ashley Cooper, Mr. Attorney-General Reynolds, Sir Henry Mildmay, Colonel Dove, Lord Commissioner Widdrington, Colonel White, Mr. Oldsworth, Mr. Leman, Lord Chief-Baron Wild, Mr. Millington, Lord Chief-Justice St. John, Mr. Robert Goodwin, Captain Skynner; or any Five of them: And are to meet in the Speaker's Chamber, this Afternoon, at Two of the Clock. 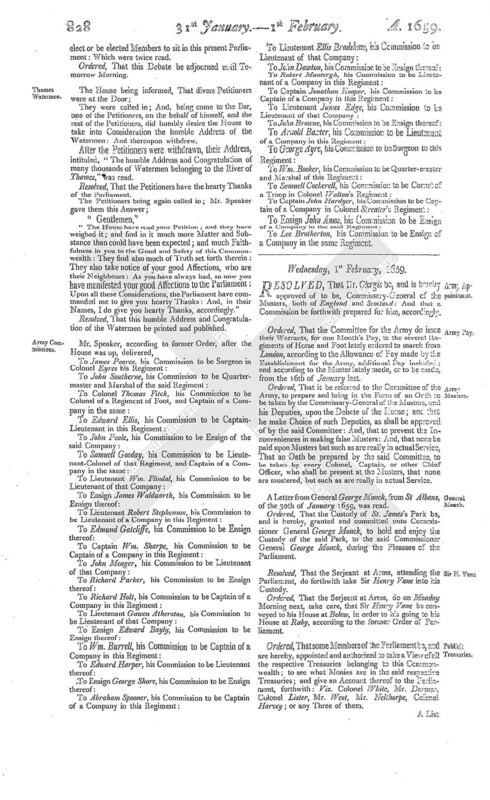 A Bill, ingrossed, for constituting a Committee for the Army and Treasurers at War, was this Day read the Third time. A Clause, ingrossed in Parchment, was tendered to this Bill, in these Words; viz. "And be it further Enacted and Ordained, by the Authority aforesaid, That be, and is hereby, appointed, constituted, and made Comptroller-General of all the Monies to be received and paid, &c.; and read the First and Second time. Ordered, That this Debate be adjourned until Tomorrow Morning. 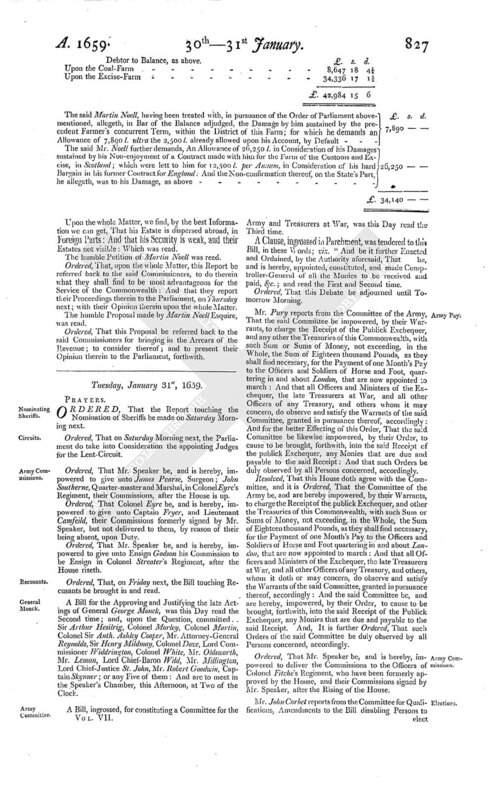 Mr. Pury reports from the Committee of the Army, That the said Committee be impowered, by their Warrants, to charge the Receipt of the Publick Exchequer, and any other the Treasuries of this Commonwealth, with such Sum or Sums of Money, not exceeding, in the Whole, the Sum of Eighteen thousand Pounds, as they shall find necessary, for the Payment of one Month's Pay to the Officers and Soldiers of Horse and Foot, quartering in and about London, that are now appointed to march: And that all Officers and Ministers of the Exchequer, the late Treasurers at War, and all other Officers of any Treasury, and others whom it may concern, do observe and satisfy the Warrants of the said Committee, granted in pursuance thereof, accordingly: And for the better Effecting of this Order, That the said Committee be likewise impowered, by their Order, to cause to be brought, forthwith, into the said Receipt of the publick Exchequer, any Monies that are due and payable to the said Receipt: And that such Orders be duly observed by all Persons concerned, accordingly. Resolved, That this House doth agree with the Committee, and it is Ordered, That the Committee of the Army be, and are hereby impowered, by their Warrants, to charge the Receipt of the publick Exchequer, and other the Treasuries of this Commonwealth, with such Sum or Sums of Money, not exceeding, in the Whole, the Sum of Eighteen thousand Pounds, as they shall find necessary; for the Payment of one Month's Pay to the Officers and Soldiers of Horse and Foot quartering in and about London, that are now appointed to march: And that all Officers and Ministers of the Exchequer, the late Treasurers at War, and all other Officers of any Treasury, and others, whom it doth or may concern, do observe and satisfy the Warrants of the said Committee, granted in pursuance thereof, accordingly: And the said Committee be, and are hereby, impowered, by their Order, to cause to be brought, forthwith, into the said Receipt of the Publick Exchequer, any Monies that are due and payable to the said Receipt. And, It is further Ordered, That such Orders of the said Committee be duly observed by all Persons concerned, accordingly. Ordered, That Mr. Speaker be, and is hereby, impowered to deliver the Commissions to the Officers of Colonel Fitche's Regiment, who have been formerly approved by the House, and their Commissions signed by Mr. Speaker, after the Rising of the House. Mr. John Corbet reports from the Committee for Qualifications, Amendments to the Bill disabling Persons to elect or be elected Members to sit in this present Parliament: Which were twice read. They were called in; And, being come to the Bar, one of the Petitioners, on the behalf of himself, and the rest of the Petitioners, did humbly desire the House to take into Consideration the humble Address of the Watermen: And thereupon withdrew. After the Petitioners were withdrawn, their Address, intituled, "The humble Address and Congratulation of many thousands of Watermen belonging to the River of Thames," was read. Resolved, That the Petitioners have the hearty Thanks of the Parliament. "The House have read your Petition; and they have weighed it; and find in it much more Matter and Substance than could have been expected; and much Faithfulness in you to the Good and Safety of this Commonwealth: They find also much of Truth set forth therein: They also take notice of your good Affections, who are their Neighbours: As you have always had, so now you have manifested your good Affections to the Parliament; Upon all these Considerations, the Parliament have commanded me to give you hearty Thanks: And, in their Names, I do give you hearty Thanks, accordingly." Resolved, That this humble Address and Congratulation of the Watermen be printed and published. To Lee Brotherton, his Commission to be Ensign of a Company in the same Regiment.